Having thickness from 0.1 to 2 mm. Least count of measurement - 0.01 mm. Canan Testing Services was established in the year 1993, under the leadership of Mr. K. K. Moncy - Managing Director, with a team of professionally qualified and well experienced engineers. 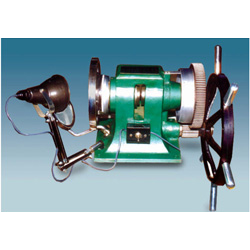 The company is engaged in sales, service and calibration of all types of Material Testing Machines manufactured in India and abroad. CTS is the first company in India to get the prestigious accreditation by NABL (National Accreditation Board for Testing & Calibration Laboratories), A Constituent Board of Quality Council of India for Calibration of Material Testing Machines. CTS has over 5,000 customers comprising of manufacturing units, processing units and testing laboratories. We are headquartered in Delhi with branches in Kolkata, Ahmedabad, Chennai and Kerala.